Most gas grill manufacturers offer a wide range from inexpensive or entry-level units, all the way up to their high-end models. This is also the case with Dyna-Glo and their Bronze 4 burner premium gas grill. It sits on a cabinet base that can store a 25 pound LP tank, with room for other tools and grilling supplies. The firebox is double walled and porcelain coated. The lid is also double walled for maximum heat retention and efficiency. The exterior of the grill is a blend of black powder coated steel accented by high gloss bronze. This gives the grill a stunning visual appearance all its own. Inside the four stainless steel burners produce 12,000 BTUs of heat each. They are protected by Enameled heat tents, which keep drippings from gumming up the flame ports, while also helping to evenly distribute the heat. The four burner elements and the fifth burner hidden under the left-hand side table can all be ignited by the Dyna Pulse Ignition System. It operates off a single AA battery which is included in the purchase. Grill grates are also something you want to pay attention to when you are shopping for a high-end gas grill. The Dyna-Glo Bronze has what you want to see with their porcelain coated cast iron grill grates with a matte finish. This helps the grates to retain and transfer heat, while also helping to prevent food from sticking. Dyna-Glo considers the Bronze to be one of their premium grills. As such, they made a point to use quality components and materials throughout. The double-walled lid and firebox make a statement of quality while also helping to maximize the grill’s overall thermal efficiency. Like a lot of other premium gas grills, there is a fair amount of assembly required. Still, you shouldn’t let that put you off. With a little bit of patience and the usual run of the mill tools that you probably already have around the house, you should be able to get the Dyna-Glo Bronze fully assembled in around two and a half to three hours. The Dyna-Glo Bronze does most of what you want and expect in a premium grill. Its temperature range is low enough to slowly grill bone-in chicken thighs or even a bone-in leg of lamb. If you want to make a steak you can fire it up to maximum flame, let the cast iron grill gates absorb the heat load for ten minutes or so, and it will create a beautiful sear. The four independently controlled stainless steel propane burner allows you to create different heat zones. There isn’t quite enough space to develop three or four heat zones. Still, if you dial one pair on a medium-high flame, and the other pair on low, you should have enough difference between the two to slowly grill in one area and sear in the other. One minor miss with the Dyna-Glo Bronze is that they didn’t design it has an accessory or handle an aftermarket rotisserie. This isn’t necessarily a big thing. Some people aren’t even interested in a grill rotisserie! Still, when you are marketing something as your “Premium” grill in the line, you sort of expect a rotisserie to be thought of. The Dyna-Glo Bronze has a grand total of 667 total square inches of grill space. This is divided between a 468 square inch primary grill grate and a 199 square inch warming rack. The warming rack is big enough to hold a fair amount of ring sausage or a single layer of pre-cooked riblets. The warming rack lacks any sort of front lip, which means every once and a while something from the top can roll or fall off. The push button Dyna Pulse Ignition is sort of what you would expect in a “Premium” grill. The fact that they include the AA battery for it, is a tiny feather in Dyna-Glo’s cap, and something that competitors don’t always do. The double walled lid and double walled firebox make the Dyna-Glo bronze very heat efficient. This is emphasized by the enameled steel heat tents that distribute the heat produced by the four stainless steel burners. The drip pan on the Dyna-Glo bronze is a little on the shallow side. This is a tad bit of a cavalier statement from them about the heat tent’s ability to vaporize grease and other types of runoff. If you happen to put something on the grill that has a lot of sloppy marinade, you could be spending a while wrestling with the drip pan and trying to clean the enameled heat tents. The primary grill grates are made from cast iron and coated in a matte finish layer of non-stick porcelain. This helps you scrape away burned on material easily. The Dyna-Glo Bronze has a 5-year warranty on the stainless steel propane burners. Then there is only a 1-year limited warranty on all other parts and components. 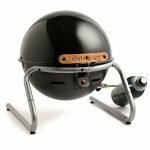 This is a little bit less than competitor grills in this category and perhaps knocks a star off of what you expect to get with a “Premium” gas grill. 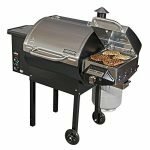 There are a lot of high-quality gas grills out on the market to choose from. When it comes to so-called “Premium” gas grills, there are some with more bells and whistles, yet they ring in at almost twice the price of the Dyna-Glo Bronze. This grill sort of kisses the word “Premium” like you kiss your mother on her birthday. At the same time, it’s more affordable than most other so-called “Premium” gas grills.